Trevor William Hoffman (born October 13, 1967) is an American former baseball relief pitcher who played 18 years in Major League Baseball (MLB) from 1993 to 2010. 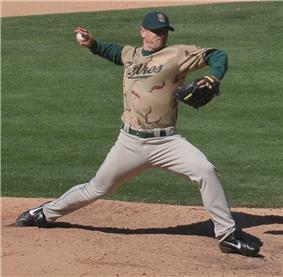 A long-time closer, Hoffman pitched for the Florida Marlins, San Diego Padres, and the Milwaukee Brewers, including more than 15 years for the Padres. He was the major leagues' first player to reach the 500- and 600-save milestones, and was the all-time saves leader from 2006 until 2011. He currently serves as senior advisor for baseball operations for the Padres. Hoffman was selected for the All-Star team seven times, and twice he was the runner-up for the National League (NL) Cy Young Award. He retired with MLB records of fifteen 20-save seasons, fourteen 30-save seasons (including eight consecutive), and nine 40-save seasons (including two streaks of four consecutive). He also retired with the highest career strikeout rate of any reliever. [note 1] Though he entered the majors with a powerful fastball, an injury after the 1994 season permanently sapped Hoffman's fastball velocity and forced him to reinvent his pitching style; he subsequently developed one of the best changeups in baseball. Hoffman's entrance at home games accompanied by the song "Hells Bells" was popular with fans. He becomes eligible for consideration for Baseball Hall of Fame induction starting in 2016. ^ a b c d e f g h i j k l m Olney, Buster (September 11, 2006). "Change Artist: How did Trevor Hoffman go from a scrawny Minor League shortstop with one kidney to a hall of fame closer? He got a grip". ^ a b c d Krasovic, Tom (March 20, 1996). "Hoffman takes heart when he takes the mound". ^ Center, Bill (August 21, 2011). "National anthem touching finale to Trevor Hoffman's day". ^ a b Center, Bill (2007). Padres Essential: Everything You Need to Know to Be a Real Fan!. Triumph Books. p. 122. ^ a b c Jenkins, Chris (September 26, 2006). "Rooted in success". ^ a b c d e f g h i j Etkin, Jack (July 2006). "Trevor Hoffman: closing in on saves record: San Diego reliever's rise to stardom has been an unassuming one of hard work, loyalty and sportsmanship". ^ Canepa, Nick (August 20, 2011). "Trevor’s time: Hoffman getting number retired". ^ Willis, Blair (2010). 2010 Arizona Baseball Media Guide. ^ Shpigel, Ben (October 7, 2010). "As Yankees’ Most Valuable Repairman, Long Revives Struggling Hitters". ^ Krasovic, Tom (August 17, 2011). "Hoffman was a hidden gem in Draft". MLB.com (MLB Advanced Media, L.P). Archived from the original on August 21, 2011. ^ Brock, Corey (January 12, 2011). "Hoffman's scout saw special arm in shortstop". ^ Kernan, Kevin (June 24, 1993). "Sheffield, Rodriguez traded to Marlins for three pitchers". ^ Nightengale, Bob (September 27, 1996). "SHOWDOWN, Part II (Dodgers and Padres)". ^ a b "1996 Season Recap". padres.com. Archived from the original on February 15, 2011. ^ Chandler, Bob; Swank, Bill (2012). Bob Chandler's Tales From The San Diego Padres Dugout: A Collection of the Greatest Padres Stories Ever Told. Skyhorse Publishing. p. 241. ^ Fallstrom, R. B. (October 4, 1996). "Eckersley Put 'Em Down in Order, Preserves Win". ^ "October 3, 1996 National League Division Series (NLDS) Game 2, Padres at Cardinals". Baseball-Reference.com. Sports Reference LLC. Archived from the original on March 4, 2011. 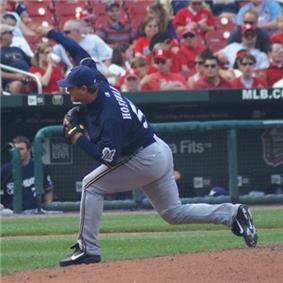 ^ "Sophomore Brian Jordan's glove and bat fuel St. Louis sweep". MLB.com (MLB Advanced Media, L.P.). October 5, 1996. Archived from the original on March 4, 2011. ^ "Finley's 3 Homers Power Padres, 11-6". ^ a b c d Tarantino, Anthony (April 19, 2004). "For whom the bell tolls: Who'd have thought 'Trevor Time' would start a majorswide trend?". San Diego Union-Tribune. Archived from the original on September 11, 2011. ^ a b c d Chandler, Bob (2007). Bob Chandler's Tales from the San Diego Padres. Sports Publishing LLC. pp. 129–130. ^ Lockwood, Wayne (July 26, 1998). "Pain of 'Fire Sale' now brings relief". ^ "Padres Survive a Rough One". ^ Reid, Jason (September 13, 1998). "T-Shirts Aren't Only Giveaway as Padres Win West". ^ a b Center, Bill (March 9, 1999). "Hoffman becomes best-paid reliever". ^ a b Whicker, Mark (January 12, 2011). "Hoffman's impact still felt in San Diego". ^ Newhan, Ross (September 30, 1998). "Powerful Astros Are Shut Down By a Brown Out". ^ Newhan, Ross (October 4, 1998). "Leyritz Still Has Magic Bat in Postseason". ^ Reid, Jason (October 8, 1998). "Padres Get By Braves". ^ a b Newhan, Ross (October 11, 1998). "Padre Pitchers Are Making Waves to Ride". ^ "October 7, 1998 National League Championship Series (NLCS) Game 1, Padres at Braves". ^ "1998 WORLD CHAMPIONS -- A SEASON TO REMEMBER". ^ Reid, Jason (October 21, 1998). "Padres Not Off Scott-Free". ^ Center, Bill; Grubb, Shaffer (September 26, 2006). "479" (PDF). ^ Lowe, John (May 2005). "Troy Percival: A Scouts Insight Helped Launched His Career". ^ Center, Bill (June 10, 1999). "'"Hoffman's 200th 'something to build on. ^ Krasovic, Tom (August 15, 2001). "Hoffman gets save to join 300 club". ^ "The Secret of San Diego: Why Trevor Hoffman of the Padres is the best closer (ever)". ^ Balsamini, Dean (September 19, 2011). "Now it's official: Mariano Rivera is the all-time MLB saves King". ^ "Hoffman Out at Least Half the Season". ^ a b c d e Center, Bill (September 26, 2006). "One pitch wound up changing baseball history". ^ "San Diego 6, Arizona 3". ESPN.com. ^ "Hoffman moves into fourth on saves list". ESPN.com. ^ "Padres snap Giants' six-game win streak". ESPN.com. ^ Krasovic, Tom (May 6, 2005). "Hoffman earns 400th save in win over Cardinals". ^ "Hoffman named winner of the 'DHL Presents the Major League Baseball Delivery Man of the Month Award' for May" (Press release). ^ Krasovic, Tom (August 25, 2005). "Hoffman taps history on shoulder". ^ Krasovic, Tom (October 9, 2005). "Dominating Cardinals eliminate Padres as Williams chased early". ^ "Elias Says ...". ESPN.com. ^ a b Bloom, Barry (September 24, 2006). 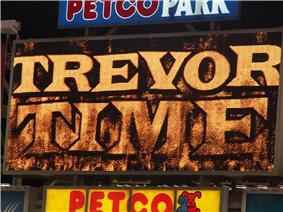 Trevor Time' reaches immortality"'". ^ Sullivan, Tim (September 25, 2006). "King of the hill". ^ Krasovic, Tom (October 1, 2006). "Fittingly, San Diego reaches playoffs with superb pitching, defensive flair". ^ Krasovic, Tom (October 2, 2006). "Gritty Padres tame woolly West". ^ "Trevor Hoffman named winner of "DHL Presents the Major League Baseball Delivery Man of the Month Award" for September" (Press release). ^ Spencer, Lyle (November 3, 2006). "Hoffman picks up Rolaids Relief honor". MLB.com (MLB Advanced Media, L.P.). Archived from the original on March 7, 2011. ^ Branam, Amanda (October 10, 2006). "Hoffman named NL Fireman of the Year". MLB.com (MLB Advanced Media, L.P.). Archived from the original on March 7, 2011. ^ "Padres stave off elimination, beat Cards in Game 3". ESPN.com. ^ Krasovic, Tom (October 9, 2006). "No sympathy cards". ^ Krasovic, Tom (April 29, 2007). "Padres find saving graces". ^ Krasovic, Tom (June 7, 2007). "Ring up No. 500". ^ "Trevor Hoffman named winner of the "DHL Presents the Major League Baseball Delivery Man of the Month Award" for May" (Press release). ^ Center, Bill (September 9, 2007). "Bradley's timetable for return unknown". ^ "Padres wait to clinch playoff spot after 11-inning loss". ESPN.com. Associated Press. September 29, 2007. Archived from the original on January 26, 2011. Retrieved January 26, 2011. Tony Gwynn Jr., son of the Hall of Famer whose statue stands outside the Padres' ballpark, hit a tying, two-out triple off Trevor Hoffman in the ninth inning and the Milwaukee Brewers beat San Diego 4-3 in the 11th on Saturday. ^ "Padres wait to clinch playoff spot after 11-inning loss". ESPN.com. Associated Press. October 1, 2007. Archived from the original on January 26, 2011. Retrieved January 26, 2011. Holliday raced home on Jamey Carroll's shallow fly ball, capping a three-run rally against the all-time saves leader, giving the Rockies a 9-8 win in baseball's longest one-game tiebreaker. ^ Krasovic, Tom (October 13, 2007). "Hoffman has minor surgery on elbow". ^ a b Sullivan, Tim (March 31, 2008). "Hoffman saved by new season". ^ Krasovic, Tom (August 15, 2008). "Bad vibes over radio like music to Peavy". ^ "Five-run 14th breaks tie, powers Padres past Nationals". ESPN.com. Associated Press. September 19, 2008. Archived from the original on February 15, 2011. ^ a b Krasovic, Tom (September 29, 2008). "Somehow, Padres could never live up to their advanced billing". ^ Krasovic, Tom (January 7, 2009). "'"GM Towers on the Hoffman situation: 'We just don't have the money. The San Diego Union-Tribune. Archived from the original on October 27, 2014. ^ a b c d e f Lemire, Joe (January 11, 2011). "Closing the book on Hoffman's slow, steady, legendary career". SI.com. Archived from the original on October 27, 2014. But Hoffman, master of the changeup, had 12 seasons with at least 37 saves -- a winning career owing to a slow and steady approach, just as the tortoise in Aesop's fable. ^ McCalvy, Adam (March 21, 2009). "Brewers' Hoffman still on the mend". MLB.com (MLB Advanced Media). Archived from the original on September 11, 2011. ^ McCalvy, Adam (April 27, 2009). "Crew keeps cool, pulls out win late". MLB.com (MLB Advanced Media). Archived from the original on September 11, 2011. ^ McCalvy, Adam (April 29, 2009). "Hoffman cranks up volume in first save". MLB.com (MLB Advanced Media). Archived from the original on September 12, 2011. ^ Haudricourt, Tom (April 28, 2009). "Hoffman's save caps comeback". ^ "Pierzynski ends Hoffman's streak as White Sox edge Brewers". ESPN.com. ^ Haudricourt, Tom (September 3, 2009). "Parra comes through". ^ a b Haudricourt, Tom (September 3, 2009). 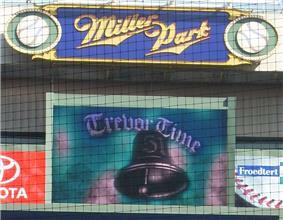 "Thursday game report: Brewers at Cardinals". ^ McCalvy, Adam (October 5, 2009). "Hoffman agrees to deal with Brewers". MLB.com (MLB Advanced Media). Archived from the original on September 12, 2011. ^ a b c d Kepner, Tyler (May 26, 2010). "After 596 Saves, Hoffman Works to Reclaim His Closer’s Role". ^ Haudricourt, Tom (April 28, 2010). "Brewers lose as Hoffman blows another". 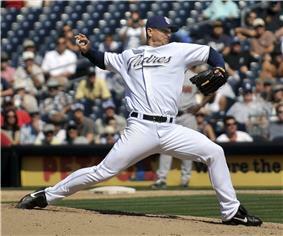 ^ "2010 Pitching Splits - Trevor Hoffman Stats, News, Photos". ^ Hayes, Dan (May 2, 2010). "Hoffman great on Saturday". ^ Hayes, Dan (May 2, 2010). "PADRES: Hells bells toll for Padres". ^ Gardner, Charles F. (May 30, 2010). "Macha to stick with Axford as closer for now". ^ a b c d e f g h i j k Bloom, Barry M. (January 11, 2011). "All-time saves leader Hoffman retires". MLB.com (MLB Advanced Media, L.P.). Archived from the original on March 7, 2011. ^ Rosenthal, Ken (August 19, 2011). "K-Rod excelling as Brewers' setup man". FoxSports.com (Fox Sports Interactive Media, LLC). Archived from the original on August 21, 2011. ^ a b c Haudricourt, Tom (September 8, 2010). "Hoffman hits 600 save mark as Brewers win". ^ McCalvy, Adam (December 24, 2010). "Saves king Hoffman at crossroads as '11 looms". ^ Krasovic, Tom (February 16, 2011). "Trevor Hoffman Taking His Time Before Delivering Next Pitch in Retirement". ^ a b c Hayes, Dan (August 21, 2011). "PADRES NOTES: Hoffman ceremony filled with surprises". ^ Sullivan, Tim (August 21, 2011). "Grand gesture is prime Trevor Time for good reason". ^ Lin, Dennis (August 30, 2014). "Hoffman inducted into Padres Hall of Fame". U-T San Diego. Archived from the original on August 30, 2014. ^ a b c d Schlegel, John (March 4, 2005). "'I needed ... an equalizer'". MLB.com (MLB Advanced Media). Archived from the original on September 12, 2011. ^ Bloom, Barry (April 27, 2005). "Hoffman definitely Hall of Fame caliber". MLB.com. Archived from the original on February 10, 2011. ^ Krasovic, Tom (September 12, 2006). "Pitchers thriving in Balsley ERA". ^ Kepner, Tyler (January 13, 2011). "Hoffman’s Talent Was Not Limited To Pitching". ^ a b c Crasnick, Jerry (June 2, 2007). "Changeup is the key to Hoffman's success". ESPN.com. Archived from the original on February 8, 2011. He makes it a point to stand at his locker and hold himself accountable on the rare occasions when he fails. ^ Singer, Time (August 21, 2011). "Black remembers Trevor as a class act". MLB.com (MLB Advanced Media, L.P). Archived from the original on August 22, 2011. ^ a b c d e Kenney, Kirk (January 7, 2015). "Hoffman eager to make entrance". U-T San Diego. Archived from the original on January 9, 2015. ^ a b "Greg Holland, Craig Kimbrel named 2014 Relievers of the Year". MLB.com (Press release). Major League Baseball. October 22, 2014. Archived from the original on October 23, 2014. ^ Pouliot, Matthew (2013-09-03). "Mariano Rivera notches ninth 40-save season". ^ a b "Career Leaders & Records for Strikeouts per 9 IP". ^ O'Brien, David (December 7, 2009). "Wagner is Braves' new closer and alpaca expert". ^ Jenkins, Chris (September 26, 2006). "Hoffman Talk". ^ Short, D. J. (September 17, 2011). "Mariano Rivera ties Trevor Hoffman for all-time saves record". NBCSports.com. Archived from the original on June 12, 2013. ^ "Mariano Rivera: In a class all by himself". 11alive.com. Sports Network. September 20, 2011. Archived from the original on June 12, 2013. ^ a b c Shea, John (January 13, 2001). "Closer Hoffman no first-ballot Hall of Fame lock". ^ Bloom, Barry M. (April 26, 2007). "Hoffman closing in on another milestone". ^ "John Smoltz Career Pitching Splits". baseball-reference.com. Retrieved January 9, 2015. ^ Capozzi, Joe (January 11, 2001). "Hell’s Bells — Trevor Hoffman, who started his career with Florida Marlins, bound for Hall after retirement". ^ Hunt, Michael (April 28, 2009). "Hoffman fits Brewers like a broken-in glove". ^ Engber, Daniel (April 14, 2006). "Hear My Song, Fear My Fastball". ^ Center, Bill (July 27, 1998). "It's not the same old song for Hoffman New entrance tune coincides with end of closer's streak". ^ Peterson, Gary (March 20, 2011). "Baseball Hall of Fame should honor AC/DC". ^ Daly, Kaitee (July 28, 2010). "John Fogerty's 'Centerfield' sparks a list". ^ Hoch, Bryan (September 15, 2011). "Cue the 'Sandman': Mariano, song synonymous". MLB.com (MLB Advanced Media L.P). Archived from the original on October 8, 2011. ^ Center, Bill (May 6, 2011). "Padres blow it but still manage to walk off winners". ^ a b Begley, Ian (September 19, 2011). "Mariano Rivera sets new saves record". ^ a b Carig, Marc (August 14, 2011). "The Yankees This Week: Mariano Rivera drawing skepticism". ^ "Career Leaders & Records for Games Finished". ^ "In Philadelphia, Lidge Keeps Opposition and Boos at Bay". ^ Brock, Corey (August 18, 2011). "Padres, fans set to honor Hoffman at ceremony". MLB.com (MLB Advanced Media, L.P). Archived from the original on August 21, 2011. ^ Lin, Dennis (February 15, 2014). "Now full-time, Hoffman tackles new job". U-T San Diego. Archived from the original on February 25, 2014. ^ Not counting Dennis Eckersley or John Smoltz, who won 148 and 209 games as starters, respectively. Hoffman met his wife, Tracy, in Buffalo, New York in 1992 where she was a real estate agent and a member of the National Football League's Buffalo Bills cheerleading squad. He asked her to marry him in 1993 while she was on the field during Super Bowl XXVII, which the Buffalo Bills lost to the Dallas Cowboys, 52–17. Hoffman has three sons: Brody, Quinn, and Wyatt. Coinciding with his retirement from playing in 2011, Hoffman returned to San Diego as a special assistant to Padres team president and COO Tom Garfinkel. "There's been a turnover of people [in the Padres front office] who wanted to reconcile and I've been cool with it. A couple of years definitely makes a big difference", said Hoffman. In addition to his front office role, he also served as an instructor during spring training. In 2014, Hoffman became San Diego's upper-level pitching coordinator, essentially an additional pitching coach for the Padres at their Double-A and Triple-A levels. His new role also involved assisting San Diego general manager Josh Byrnes. Under General Manager A. J. Preller in 2015, Hoffman became senior advisor for baseball operations, overseeing pitching instruction at all levels of the Padres' minor league system. In 2014, Major League Baseball introduced the Trevor Hoffman National League Reliever of the Year Award, which is awarded annually to the top reliever in the NL. Hoffman becomes eligible for induction into the Baseball Hall of Fame starting in 2016. No career reliever has reached Cooperstown on the first ballot,[note 5] and only six relievers have been inducted as of 2015. Lee Smith, the all-time saves leader for 12 years before he was surpassed by Hoffman, was not inducted in 2015 after 13 years on the ballot. Hoffman is generally considered worthy of being elected. Buster Olney of ESPN says any discussion of Hoffman's deficiencies in the postseason and All-Star Games are small samples compared to his incredible body of work over 18 years. Zimniuch wrote that Hoffman and Rivera are "the best of the best of the one-inning closers". Closers as a whole have been criticized for pitching almost exclusively in the ninth inning with no runners on base. Star relievers previously were called firemen and entered games in the middle of innings with runners on base and could pitch multiple innings. Saves arguably became overrated as firemen gave way to closers. However, Joe Strauss of the St. Louis Post-Dispatch in 2007 proposed that 500 saves (let alone 600) would be enough for him to validate Hoffman's induction if Sutter was invited with his 300 career saves. Moreover, Hoffman might have accumulated much more than 601 saves had he played for more successful teams. During his tenure in San Diego, the Padres won at least 90 games only twice and had nine losing seasons, including five with no more than 70 wins. Hall of Fame voter Dan Graziano of the Newark Star-Ledger said, "I don't think much of the save as a stat, but I'm looking at a guy who's been a lockdown closer for more than a decade. Closers are a real and important part of the game, and either he or Rivera has been the best one for the past decade." During the time Hoffman held the career record for saves, many still considered Rivera the best closer of all time. Like many other relievers of his era, Hoffman was compared to Rivera and his success in the playoffs. While Hoffman had 601 regular-season saves, he only had four in the playoffs. Jayson Stark of ESPN wrote after Hoffman's retirement announcement, "Not everybody can have his team deliver him an October save opportunity to protect 47 different times." His last postseason save was in 2006, which was also his first postseason save in eight years. Though the Padres were in the playoffs three other times in that span, they never took a single lead. Hoffman, however, did blow a save opportunity in his only World Series appearance and also failed on save tries twice in the final three days of the 2007 season as the Padres vied for the playoffs. John Delcos of The Journal News, who covered the New York Yankees for eight years, believes the Yankees would have been just as successful with Hoffman instead of Rivera. David Wells, who played with both Hoffman and Rivera, said, "[Rivera] has the better postseason record because the Yankees go to the postseason more than the Padres do, and he's had more opportunities there. The way they go about it, they're the best in the game. Trevor's the best in the West and [Mariano] is the best in the East." Rivera, however, broke Hoffman's career save record in 2011. Though he was not a power pitcher, Hoffman was a strikeout pitcher. His 9.36 strikeouts per nine innings pitched (K/9) was the fifth-highest in MLB history, and highest ever among relievers. [note 1] Sports journalist Fran Zimniuch wrote in Fireman: The Evolution of the Closer in Baseball that Hoffman was "a thinking man's closer, using guile rather than heat." As the velocity of his fastball decreased, he compensated with a devastating changeup that is as synonymous a pitch with Hoffman as the splitter is with Bruce Sutter or the cutter is with Mariano Rivera. "It's a tough situation throwing a change-up in the ninth inning, unless you've got Trevor's changeup", closer Billy Wagner said. "There's not many guys who have a changeup that's dominating", All-Star third basemen Scott Rolen said. "But his is dominating. It's a weapon. That's not usually a word you use with a changeup." Robb Nen, a retired closer, was amazed at how Hoffman got better after he lost velocity on his fastball. "I don't think I could do it, to just lose the ability to throw 95 and still be one of the best. I have tremendous respect for him", Nen said. Another retired closer, Troy Percival, concurred about the difficulty in transforming from a power pitching style. "It's not easy to do. Guys who throw 95, 96 [mph] have an ego about being able to do that. [Hoffman] just went right into, 'Hey, you know, I throw 87 now. This is what I've got.' And he goes out there and gets it done just as well as he ever did." Hoffman had 12 seasons with at least 37 saves, 13 seasons with a sub-3.00 ERA and 14 with an ERA+ of at least 130 (indicating that he was at least 30 percent better than the league average in ERA those years). Among pitchers to debut since 1969, he is one of only two ranked in the top 10 for lowest opponents' batting average against facing both lefties and righties. [note 4] Hoffman retired ranked first with 856 games finished, ninth with 1,035 games pitched, seventh-lowest in hits per nine innings (H/9) at 6.99, and seventh-best in strikeout-to-walk ratio (K/BB) of 3.69. He had a 2.87 ERA and 1.06 walks plus hits per inning pitched (WHIP) for his career. Hoffman dominated his position at a consistent level while enjoying incredible longevity over almost two decades. He was the first pitcher to reach not only the 500 save milestone, but also 600. After an 18-year career, the seven-time NL All-Star retired as MLB's all-time leader in saves with 601, and converted on 88.8 percent of his save opportunities. Barry Bloom of MLB.com called Hoffman "the best National League closer of his era." Hoffman is one of only three pitchers who have had streaks of four straight seasons with at least 40 saves;[note 3] he achieved it twice. His nine seasons of 40 or more saves are tied for the most all-time. His 15 1⁄2-year stint as Padres closer was rare for a baseball role that exhibited a high turnover rate. said in 2002, "but everybody here looks to Trevor. This is his team. "Phil Nevin "It's very unusual for a pitcher, especially a relief pitcher, to be the team leader", Padres first baseman  He was known as a leader in the clubhouse and a tutor to younger players. 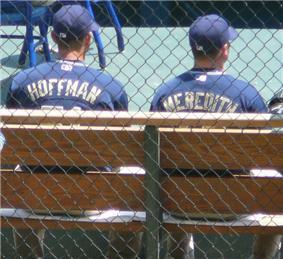 He mentored his successor in San Diego,  Hoffman was long regarded as one of the great teammates in baseball. Padres general manager  After Hoffman resurrected his final season and recorded his 600th save, Macha said Hoffman's "work ethic and perseverance paid off ... He had to grind it out to get there." Hoffman is known for his high leg kick, the menacing glare through his cap pulled down almost to his eyes, and his deceptive changeup. When Hoffman first came into the league, he could throw up to 95 mph. He would also throw a slider and only an occasional changeup. His original changeup was a conventional circle changeup taught to him by Cincinnati scout Larry Barton. Hoffman learned a different changeup, which he throws with a palmball grip, from teammate Donnie Elliott in 1994. He began using the new changeup in 1995 when his fastball had dropped to 88–90 mph after his offseason injury on the beach. With the decrease in velocity, Hoffman knew he could not rely as much on his fastball. He played through 1995 and had surgery the following offseason for a torn rotator cuff. When he returned the following year, Hoffman's fastball was at 87–88 mph, but he had more experience with his new changeup. His fastball reached back as high as 91 mph in 1998, but by sometime after 2000 it dropped down to 83–88 mph. His repertoire by then included primarily of his changeup, a four-seam fastball, a slower cut fastball that moves in towards a left-handed batter, and the occasional slider and a curveball. On August 30, 2014, Hoffman became the ninth inductee into the San Diego Padres Hall of Fame. In 2006, Hoffman was named to his fifth All-Star game, but was the losing pitcher in the game after having two strikes with two outs to Michael Young, who was later named the All-Star Game Most Valuable Player. His All-Star performance bothered him, and he suffered two of his five blown saves that year in the week that followed. August 20 marked Hoffman's 776th outing for the Padres, breaking the Pirates Elroy Face's major league record for most relief appearances with one club. On September 24 in the Padres last home game of the year, Hoffman retired eventual 2006 NL batting champion Freddy Sanchez for the final out of a 2–1 win over the Pittsburgh Pirates, keeping the Padres 1 1⁄2 game lead atop the NL West with seven games left to play. With the save, Hoffman became the all-time Major League saves leader, surpassing Lee Smith's record of 478. As the Padres celebrated on the mound with Hoffman, the Pirates remained in the dugout watching in respectful salute. "I've never seen a crowd get into one inning for one guy like that before", said Pirates reliever John Grabow. "You get goose bumps even if you are on the other team." The Padres presented Hoffman with a golden bell trophy, a reference to "Hells Bells". During the 1998 season, Hoffman began entering save situations in Padres home games to the entrance music of AC/DC's "Hells Bells" playing over the public address system, an event that came to be known as "Trevor Time". The tradition began July 25, 1998, and the song was chosen by a Padres salesman. The crowd was excited by the tolling of the bells from the song, and the scoreboard showing Hoffman running in from the bullpen. Hoffman preserved a 6–5 win against the Houston Astros by striking out Moisés Alou to end that game and converted his 41st consecutive save opportunity, tying an MLB record at the time. The following night, Hoffman's streak ended on an Alou home run, though the Padres ended up winning the game. It was Hoffman's only blown save of the regular season. On September 1, he saved a 9–8 victory over the New York Mets for his 45th save, breaking the club record set by Mark Davis in 1989 when he won the Cy Young Award. On September 12, the Padres clinched their second division title in three years after Hoffman saved an 8–7 win over the Dodgers. In a 4–3 win over the Chicago Cubs on September 14, he worked a perfect ninth inning and became the fourth reliever in MLB history to reach the 50-save mark. Hoffman had a career-high 53 saves and a career-best 1.48 ERA. His saves tied the NL single-season record set in 1993 by the Cubs' Randy Myers. Opponents batted .165 against him, and the first hitters he faced hit .129. His ERA in save situations was 0.49, and he struck out 10.6 hitters per nine innings. The Padres were 62–4 in games he pitched. Hoffman was runner-up in the Cy Young Award race that year to Tom Glavine of the Atlanta Braves, despite receiving 13 first-place votes to Glavine's 11. Hoffman was left off of six ballots. Hoffman and Adam Wainwright in 2009 are the only two pitchers to ever receive the most first-place votes and not win the Cy Young. Hoffman won the Rolaids Relief Man of the Year Award and captured another Fireman of the Year Award. He finished seventh in the NL Most Valuable Player (MVP) Award voting. In both 1996 and 1997, Hoffman pitched over 80 innings, with 111 strikeouts, averaged approximately 40 saves, and had ERAs of 2.25 and 2.66. In 1996, the Padres entered the last three games of the season in Los Angeles trailing the division-leading Dodgers by two games. Hoffman recorded saves in each of the final three games against the Dodgers, as the Padres won the NL West for their first division title in 12 years. After finishing the season with 18 straight saves, Hoffman was named The Sporting News NL Fireman of the Year in 1996. The Padres played the St. Louis Cardinals in the 1996 National League Division Series (NLDS) and were swept in the series 3–0. Hoffman entered Game 2 with the score tied and one out and inherited runners on second and third. A run scored as he retired the only two batters he faced, and the Padres lost 5–4. In Game 3, Hoffman recorded the loss as he came into the tie game and allowed a 2-run homer to Brian Jordan for a 7–5 loss. The following season on June 23, 1997, he came in with the bases loaded in the ninth inning and struck out J. T. Snow to save the 11–6 win over the San Francisco Giants and became the Padres' career saves leader with 109, passing Hall of Famer Rollie Fingers. In 1995, Hoffman pitched hurt from spring training through the season and finally had off-season rotator cuff surgery. "[Hoffman] never bitched about his arm, which was killing him from Day One ... He was out there when most guys wouldn't have been", said Smith. This is also the year during which he developed his changeup. During the strike-shortened 1994 season, Hoffman took over closer duties from an injured and ineffective Gene Harris in mid-April. Hoffman recorded 20 saves and a 2.57 ERA. The weekend after the strike began, Hoffman, playing Nerf football at Del Mar Beach near San Diego, dived for a pass and landed awkwardly on his right shoulder. He later played volleyball and landed on the shoulder again while going for a dig. He heard a strange sound. Left unprotected by Cincinnati in the 1992 MLB Expansion Draft, Hoffman was selected by the Florida Marlins with the eighth pick in the first round. In his first major league season in 1993, Hoffman learned by observing Marlins closer Bryan Harvey's balanced demeanor. After earning two saves with the Marlins as an unknown rookie, Hoffman was traded midseason to the San Diego Padres during San Diego's 1993 fire sale. The Padres sent third baseman Gary Sheffield and pitcher Rich Rodriguez to the Marlins for Hoffman and pitching prospects José Martínez and Andres Berumen. Padres general manager Randy Smith said at the time, "The only way to acquire quality players is to give up quality." The year before, Sheffield had won the NL batting title and made a run at the Triple Crown. Smith insisted that Florida include Hoffman in the deal. Padres fans, upset at the trade, booed Hoffman during his first several appearances. He allowed three runs in his one-inning debut with San Diego, eight runs over his first three outings, and blew his first save opportunity as a Padre. Hoffman was selected by the Cincinnati Reds in the 11th round with the 288th overall selection of the 1989 MLB Draft, and he signed for $3,000. Prior to the draft, Reds scout Jeff Barton talked to Hoffman about playing another position. Hoffman was open to anything that might advance his career, and they talked about catching or pitching with his exceptional arm. Barton ranked Hoffman's arm an 80 on a 20–80 scale, where 60 was above average and 80 was a rarity. Hoffman played shortstop and third base for the Reds' Single-A affiliate Charleston. In his first 103 games, he only batted .212 with 23 runs batted in. Not showing much batting potential, Hoffman was converted to pitcher in 1991 at the suggestion of Charleston manager Jim Lett, who also grew tired of Hoffman overthrowing first base. Hoffman threw 95 miles per hour (153 km/h) and recorded a 2.90 ERA with 169 strikeouts in 142 2⁄3 minor league innings over two seasons while alternating between relieving and starting at Single-A Cedar Rapids, Double-A Chattanooga and Triple-A Nashville. Because of his damaged kidney, Hoffman was not allowed to play football or wrestle. Hoffman went to Savanna High School as had Glenn, which put pressure on Hoffman following his more talented older brother. Ed, who did not trust that coaches would protect Hoffman's arm, stopped allowing his son to pitch after he was 12 years old. Hoffman played shortstop at Savanna, but nobody offered him a scholarship out of high school. He grew three inches over the summer and continued playing at Cypress College, and later for the University of Arizona from 1988 through 1989. Arizona was afraid of the liability if Hoffman's remaining kidney got hit by a baseball. "I told them the one kidney I have is on my right side. That's not the side that faces the pitcher when I hit, so it was O.K. They bought it", said Hoffman. He led Arizona in hitting in 1988 with a .371 batting average, 35 points better than teammate J. T. Snow. Other notable teammates included Scott Erickson and Kevin Long. Hoffman exhibited a strong throwing arm playing shortstop. Given their age difference, Hoffman considered his brothers more role models than playmates. "[Glenn] was the guide while Greg was the drill instructor", said Hoffman.